During 1940, while the United States had been looking to its defenses in Alaska, Hawaii, and Panama, while the exchange of destroyers for a string of Atlantic bases was under negotiation, and then, while plans and preparations for developing the new bases were getting under way, Britain and Canada were consolidating their position in the North Atlantic by stationing troops in Iceland and were attempting to counter German activities in Greenland. Although the United States Government had acquiesced in the garrisoning of Iceland, it had no desire to see Britain make the same move into Greenland; for Greenland, although a Danish colony, was, unlike Iceland, definitely within the Western Hemisphere and within the scope of the Monroe Doctrine. Should Canada take protective action in Greenland, it was feared that a precedent might be established which would give Japan an excuse to seize the Netherlands East Indies if the Germans invaded Holland. British, Canadian, and American diplomacy went through a good many convolutions, more fittingly described elsewhere, before the lines of policy took shape.1 The official American position, simply stated, rested on nonintervention, on the traditional "hands off" policy of the Monroe Doctrine, and on noninterference. The United States, for several reasons, had refused to commit itself to the defense of Greenland and at the same time had declared its objection to any military action in Greenland by Britain or Canada or to any attempt on their part to establish control over Greenland. to investigate airfield sites and to examine the possibility of constructing the various facilities-radio, navigational aids, and the like that would be necessary for developing the airfields. It was further agreed that it would be to the best interests of the United States if the Danish authorities in Greenland were to undertake the actual construction with the financial and technical assistance of the United States.4 These decisions were the springboard for all subsequent American activities in Greenland. Presidential approval and the consent of the Danish authorities in Greenland followed the conference of 6 February without much delay. By the end of the month a Coast Guard vessel had been made available for the survey party, lists of special clothing and equipment were being compiled, and the Army members of the party were designated.5 Then, almost on the eve of sailing, an important decision was made, which completely changed the expedition's focus. 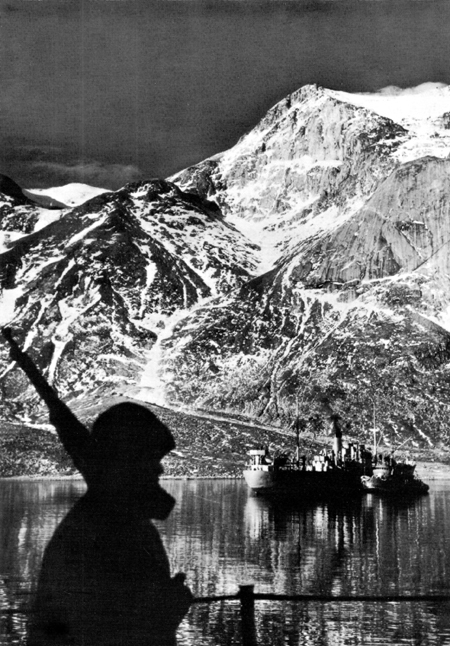 At a meeting of Army, Navy, Coast Guard, and State Department representatives in Mr. Berle's office on 5 March it was agreed that "considerations of defense, jurisdiction, operation and maintenance" made construction of the facilities by the Danish authorities in Greenland impracticable, that the Army would therefore build the necessary landing fields, and that the State Department would negotiate an appropriate agreement with the responsible authorities.6 On 17 March the survey party under the command of Comdr. William Sinton, USN, boarded the Coast Guard cutter Cayuga at Boston and sailed for Greenland.7 A Royal Canadian Air Force observer accompanied the party. and on this date an agreement guaranteeing the security of Greenland with the United States as guarantor was signed by Secretary of State Hull and Mr. Henrik Kauffman, the Danish Minister. Preparations for sending a construction party and a defense force to Greenland were begun immediately. A survey of the east coast, which the Air Corps had decided was necessary, was quickly organized.9 The Greenland defense agreement was the culmination of the State Department's efforts to meet the problem posed by the convergent interests in Canada, Great Britain, and the United States; while these other preparations followed both from the agreement itself and from the expanding activities of the Air Corps. tions.13 These considerations explain the Army's interest in the survey of Greenland that was planned for the early summer of 1941. Although in General Arnold's opinion there were only two reasons for establishing bases in Greenland, namely, protecting convoys and ferrying planes, there was in actual fact another element which was becoming increasingly decisive.14 This was the defense of Greenland itself. The problem-for, because of the terrain, the climate and general physical features, it could not be considered otherwise-was a dual one. It involved, first, the fact that Greenland was a major source of cryolite for the aluminum industry of the United States and Canada and, second, that it was the breeding ground of western Europe's storms. TROOPS EXAMINE GERMAN PARACHUTE KIT found at site of abandoned German radio base in Greenland. The President agreed with his advisers that the situation called for a well-armed naval expedition rather than an Army garrison. He approved the idea of sending one or two Navy patrol planes to Iceland for an inspection flight or two over the Scoresby Sound area, but he disagreed with the suggestion that Iceland be used as a more or less permanent base of patrol plane operations. The upshot was that the Navy proceeded to organize an east coast "survey" party for which the Coast Guard provided specially equipped vessels and experienced crews. For the time being the Army's assistance was not required.22 The War Department could therefore concentrate its attention, so far as concerned Greenland, on constructing the airfields and on garrisoning the west coast. During the following month the several interested divisions of the General Staff worked out the various derails of the construction force. A momentary hitch developed when the Navy Department decided it could not spare any of its transports because of the two months' layover that would be required at the base; but this particular problem was solved by the War Department's transferring to the Navy a recently acquired Army transport, the U.S.S. Munargo, to be fitted out and used for the movement, and in addition to the Munargo, the veteran troopship Chateau Thierry was later assigned. As decided upon in mid-April, the Greenland force consisted of one battalion (minus one company), 21st Engineers (AVN), reinforced by a composite battery, 62d Coast Artillery (AA), plus the necessary service troops. The departure, originally scheduled for 19 May, was delayed a whole month for repairs to be made to the Munargo; but on 19 June the two ships sailed out of New York Harbor with the 469 officers and men of the Greenland force on board.24 Col. Benjamin F. Giles, Air Corps, was in command. By the end of September 1941, when the contractor's people arrived, the troops at BLUIE WEST I had erected 85 buildings, about two-thirds of the total needed for the initial force, and had begun to install the necessary utilities. They had built three miles of access roads, constructed a temporary dock, and started work on the airfield. By the time the civilian construction force arrived they had finished grading one of the two runways and had a metal landing mat partly laid. BLUIE WEST I was thus one of the earliest U.S. Army airfields, if not the first, to make actual use of steel matting in runway construction, an important engineering development that was still being tested two months later in the Carolina maneuvers and one that afterwards contributed greatly to the winning of the war, in the Pacific particularly. After the arrival of the civilian construction force the engineer battalion, reinforced by a company of the 42d Engineers (General Service), concentrated exclusively on airfield construction. They continued to do so until February 1942 when the civilian force took over this work as well. By then the first runway was ready for limited use. movement of the Eighth Air Force to England put the two Greenland airfields to their severest test, migrating aircraft had to share the runways with bulldozers and rollers and all the other paraphernalia of construction; for work was still in progress although the fields were usable. From the beginning the garrison enjoyed excellent relations with the local populace. The Danish authorities in Greenland gave the American command their full co-operation and advice at all times, without which the problems of establishing the bases would have been greatly magnified. Troops and civilian workmen acquitted themselves well.29 That there were no AWOL's or desertions is perhaps not too surprising since there were no places to go, but the fact that there were likewise no courts-martial, at least during the first year, is a record of which any commanding officer can be proud. With Greenland, as with many other outposts of the Western Hemisphere, the War Department faced the problem of passing safely between the Scylla of remote contingency and the Charybdis of immediate need. The question of what ought to be planned for and what on the other hand could be, or had to be, provided posed a dilemma that would have to be resolved if plans and preparations were to bear any relation to each other. would, if acted upon, temporarily disrupt the mining operations. The question of what to do in the spring was more easily answered (perhaps one might say more easily avoided), since the Army expected to be able by that time to start building the housing and other facilities necessary for a garrison at Ivigtut. A naval vessel, the Greenland Government suggested, could be stationed at the cryolite port to bridge any gap between the departure of the mine guard and the arrival of an Army garrison.35 There the matter was resting when the attack on Pearl Harbor brought the United States into the war. would be extremely difficult, since the distance that would have to be covered was as far as from Newfoundland to Key West, Fla. The naval patrol maintained by the Coast Guard was limited by ice conditions. What appeared to be the ideal solution, and the one recommended by the Coast Guard, was to organize a dog sledge patrol for reconnoitering the isolated areas of the east coast. After some hesitation the War Department agreed to bear the expense, to furnish part of the equipment, and to provide what air coverage it could. The Coast Guard, for its part, would transport the patrols and equipment to their stations and keep them supplied. 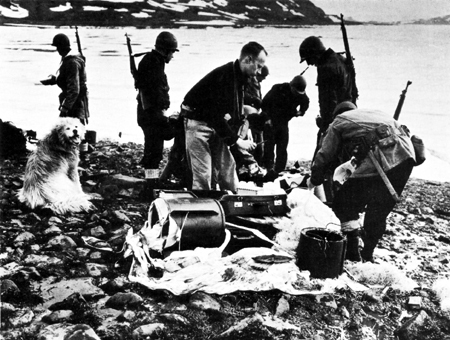 The Greenland administration in turn agreed to recruit the men and provide the dogs. The patrol had scarcely begun operations when it proved its worth by assisting in the capture of the trawler Buskoe on 12 September, as that vessel, a small German-controlled Norwegian ship, was attempting to establish a radio and weather station in the Mackenzie Bay area. There had been some skepticism, however, in the War Department, and by the end of the year there were those who had begun to wonder whether the results justified the expense involved.38 Had it been a matter of merely hiring a few Eskimos to patrol the neighborhood of their villages with their own dog sledges the $2,000 or so the Army was spending each month on the patrol might have been excessive indeed. But as it was, except on the west coast north of Holsteinsborg, dog sledging was unknown in Greenland and, except for the settlements at Angmagssalik (BLUIE EAST 2) and Scoresby Sound, the entire east coast was uninhabited. This meant that dogs, sledges; and drivers had to be brought in either from halfway up the west coast, a distance to Scoresby Sound of at least 2,400 miles, or from the continent. 39 On one occasion a team of sledge dogs was imported from the United States by way of Iceland. The patrol, whose principal function was to report Nazis attempting to land in the guise of innocent hunters, had to be recruited from Danish and Norwegian hunters of proven loyalty. All this was expensive. The sledge patrol nevertheless survived the early doubts within the War Department, was afterward given military status as a unit of the U.S. Army, and in 1943-44, when the tempo of operations increased, the patrol found itself in the thick of combat. But that is another chapter of the story.